Despite your party affiliation, one thing is clear—our country turned the page and began writing a new chapter in 2017. If you’ve walked a boat show since the presidential election, you were likely swamped by the positive energy on the docks. Marine manufacturers and dealers of every ilk are excited about the new administration and the promise of further economic stimulus. The consensus is that the next 4-6 years will likely bring a wealth of opportunities and further strengthening to the marine marketplace. Many major manufacturers have recently invested substantial amounts of capital into their workforce and facilities. Everyone is hopeful that new boat manufacturing capacity and supply will continue to improve. However, it will remain critically important to plan ahead to ensure that the availability and delivery of your new dream boat fits with seasonal expectations. We encourage you to seek out a Bluewater brand expert as early as you can in your thought process, so we can work diligently to meet your needs. By collaborating directly with the manufacturer to work you into the production schedule or by tapping our connections for “back pocket” listings yet to come available, Bluewater has the extensive network and rock-solid relationships that can often get you out on the water sooner. If you have a boat that needs to sell before you can commit to the next one, the process should start even earlier, and Bluewater’s highly experienced listing agents are more than up to the task. 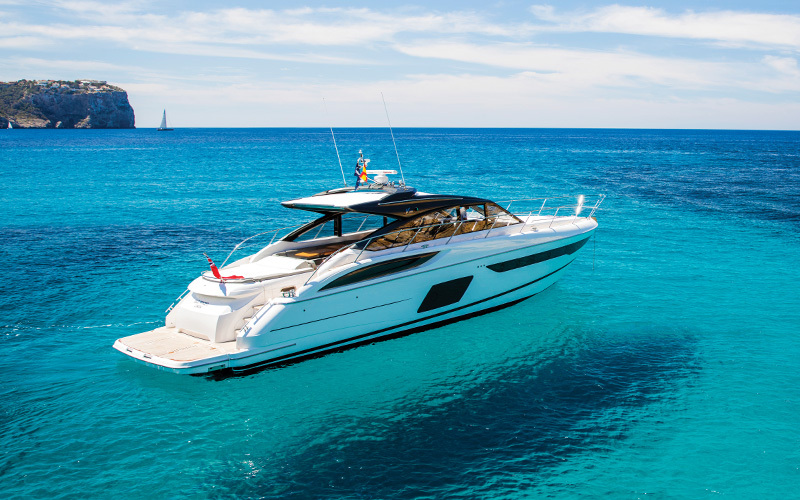 Brokerage activity continues to be our bread and butter and we’ve seen used boat values continue to climb. Owners of clean, quality boats are being consistently awarded for their efforts with above-average compensation and quick sales with the help of Bluewater’s superior marketing exposure. There has never been a more interesting time to be building, buying, selling or upgrading a boat, and Bluewater Yacht Sales is uniquely positioned to help you with all of those activities. The pace of technology and innovation being integrated into today’s yachts is fascinating. Joystick controls, bow thrusters and gyro stabilization are completely changing the handling characteristics of yachts large and small. The intense competition in marine electronics is delivering amazing results in touchscreen displays, 3D and thermal imaging, and so much more. Diesel and gasoline engine manufacturers are extracting more horsepower and efficiency from smaller, quieter packages than ever before. For those of us who appreciate the latest and greatest, Bluewater is capable of making it happen—whether that means outfitting a new boat or upgrading your current vessel at one of our three award-winning service yards. Despite whether you’re looking to sell or buy, Bluewater has the resources, partners and expertise to update your vessel for a quicker sale, or to perfectly customize it to your desire. From an administrative standpoint, Bluewater continues to make extraordinary investments in infrastructure, locations and personnel. Great efforts are being taken to streamline our processes and make our business more efficient and modernized, ultimately delivering a greater value to our customers. We continue to align ourselves with the strongest brands possible—those we feel are poised to capitalize on economic improvement and have also shown a strong commitment to building the highest quality yachts, and working with us to support them throughout our customers’ careers. Boating is a lifestyle choice that often lasts a lifetime, and Bluewater is fully committed to building the relationships necessary to help you at every stage of your voyage. We can’t thank our customers enough for entrusting Bluewater with this honor and we look forward to continuing to boat, fish and cruise alongside you.